For a week after the resurrection of Christ, that is from Easter Sunday until the following Saturday, we say the following prayer, instead, three times, twice a day. we venerate(worship, kiss) the holy Lord Jesus the only sinless. and your holy resurrection we chant and glorify. Besides you we find no-one. 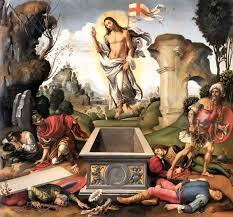 Let all believers venerate the resurrection of Christ. You endured the cross for us, and You killed death. From the resurrection of Christ until His ascension, that is for forty days, we conclude our prayer with: Christ is risen from the dead, trampling down death by death, and to those in the tombs, granting life. In these forty days instead of saying hello we say: Christ is risen. We reply: He is risen indeed.